Color can evoke emotion, capture attention, and send a message. Whether you're designing business cards, setting up a photo shoot, or shopping for throw pillows for your canary-yellow couch, choosing the right colors is important. Unless you've had a class in color theory, picking colors that go well together can be an exercise in frustration: Some colors pair up nicely, some don't, and who the heck knows why? Here, I'll review a little color theory as well as how to choose colors using a gadget that dates back to the 17th century. 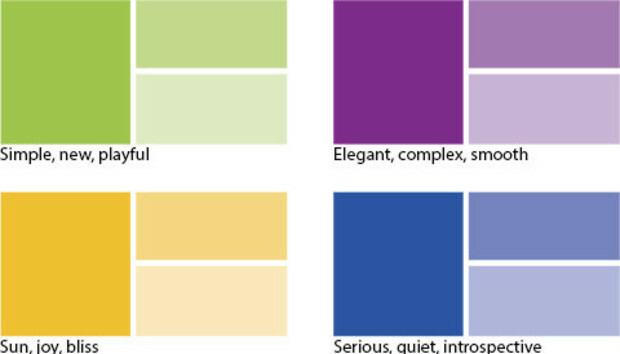 A color scheme (or color palette) refers to the group of colors you use in a project, a painting, or your living room. Just take a look at any book cover, magazine ad, or website and you'll see that it's made from a certain set of colors. The designer usually picks a main color and then chooses the other colors according to how they look together and the feeling they evoke when they're viewed as a group. There's a whole science behind picking colors based on what they mean to us humans and how they make us feel, as shown in the image below. Those meanings and feelings can differ according to geographic location. For example, hospital rooms and public spaces are typically bathed in pale blue or green because those colors have a soothing effect, while a popular chain of truck stops (Loves) are swathed in bright yellow and red to keep drivers awake and alert, and Apple stores are predominantly white to reflect a feeling of elegance and simplicity. To learn more about how colors make us feel, pick up a copy of Pantone's Guide to Communicating with Color by Leatrice Eiseman or purchase the Galaxy Color Map Pro ($15 plus shipping), a fold-out, laminated guide to finding and specifying CMYK colors (great for print designers). It also includes a color wheel as well as a color emotion chart (great for everyone). Hue is a term for pure color, before it's had any white or black mixed with it. Pure color mixed with white is called a tint because it produces a lighter color than you had before (blue plus white equals light blue). Pure color mixed with black is called a shade and produces a darker color (blue plus black equals dark blue). Saturation describes a color's vibrancy. For example, a highly saturated hue has a vivid, intense color. A less saturated hue looks dull and gray. When picking colors that will appear side-by-side, it's helpful to use similar saturation values. Brightness determines how light or dark a color appears. You can think of brightness as the amount of light shining on an object, ranging from white (100 percent) to black (0 percent). The simplest way to pick colors is to use a color wheel--a circular diagram of colors arranged by their relationships with one another. A color wheel is based on the three primary colors: yellow, blue, and red, from which all other colors spring. By mixing equal amounts of the primary colors, you get a second set of colors called secondary colors. Mixing equal parts of the secondary colors gives you a third set of colors called tertiary colors. Together, these colors comprise the color wheels shown here. Using a color wheel is a two-step process: start by picking the main color you want the color scheme to revolve around--the colors in, say, a logo, a photo, or a canary-yellow couch--and then find the closest match to that color on the color wheel. Next, use one of the following color-scheme rules to identify where on the color wheel you should look to find other colors that go well with the first one. Monochromatic schemes use colors from the same wedge of colors on the color wheel. Analogous schemes use colors from the wedges on both sides of the main color. Complementary schemes use colors from the wedge directly across from the main color. Most color wheels have a spinning-dial component that you use to point at your main color, and then a series of arrows that point you to associated color wedges for a particular color-scheme rule, as shown here. Using a color wheel is easy, once you get the hang of it. And when you do, you'll be picking perfectly pleasing palettes in no time. « Will BYOD Give Rise to the Enterprise Genius Bar? Fitness wearables: Who's tracking who? Wearable Tech Show: Wearables get a reality check?